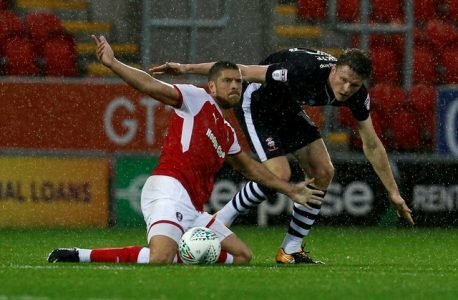 Rotherham United striker Jamie Proctor wishes he could be out there with the lads getting ready for the play-off games. The twenty-six year old has been side-lined since damaging his Anterior cruciate ligament after just six games but is now on the road to recovery. ‘I’d love to be involved in the next couple of games,’ Jamie told iFOLLOW ‘but I think they’ve come just to early for me. Though, in the long term I think that will be beneficial to me. ‘But everything is going alright. I’m back out doing little bits now, feeling good, feeling strong and hopefully come pre-season I’ll be flying and ready to go. Ed Note – We hope the same, Jamie. ‘I’ve spent around nine months in the gym so to be outside and seeing the lads train and to be out there myself gives me that extra boost and is always a positive. And with the season we’ve had and how well the lads have done and the good atmosphere around the place has helped me with my recovery.